PIN - SARAH COVENTRY. "CORALINE" FROM 1974. 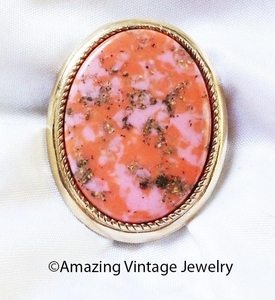 INSPIRED BY THE BEAUTIFUL CORAL OF THE SEA, THIS PIN HAS A MARBLED CENTER STONE HAS GOLDTONE FLECKS THROUGHOUT AND NO TWO PIECES ARE EXACTLY ALIKE. PIN/PENDANT 1 7/8" LONG, 1 7/16" ACROSS. VERY GOOD CONDITION.